I remember buying records at 12-inch in 1995 when I was a sophomore in college. I’d be excited to spend my last few bucks on doubles of “1,2 Pass It” and “Return of the Crooklyn Dodgers”. Then I’d be hungry. I remember trying to collect all of those Nervous party records from 12-inch… Bozo Meko and Brooklyn Slumlordz and all those. I remember the last of the under $5 12-inches. I met Afrika Bambaataa for the first time at The Hut. I sold a bunch of mix cd’s on consignment at The Hut. I remember consistently dropping $200 a pop and up at The Hut. Welcome back fellas! 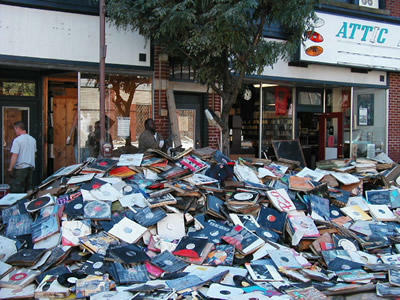 I hope this new vinyl/digital hybrid business plan is a smash success!